Yummy low carb blueberry muffins to start your day. 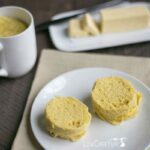 These gluten free muffins are quick and easy to prepare as a warm breakfast treat. I woke up this morning craving some blueberry muffins. It’s probably because I was snacking on some freshly picked blueberries last night. I couldn’t decide whether to use coconut flour or almond flour so I used a mixture of both. 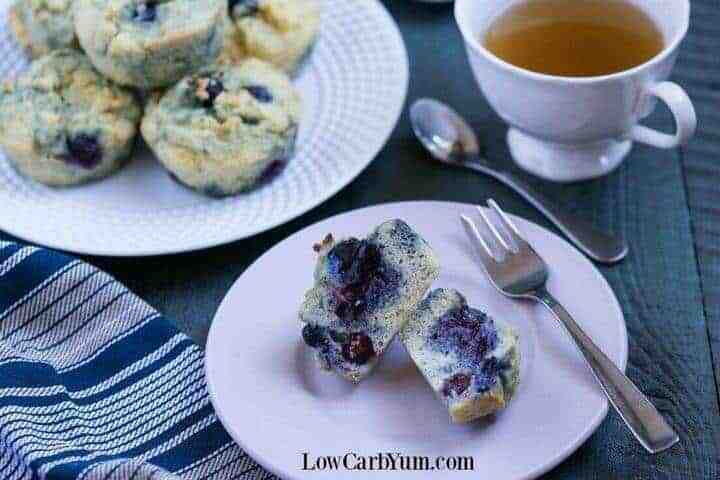 These low carb blueberry muffins taste great just as they are. However, I prefer to cut them in half and grill them in butter. I do this in a large iron skillet. It’s the best way to serve muffins. We used to go to a country restaurant that offered blueberry muffins as an option to biscuits or bread. I’d always get the muffins with my eggs and bacon. Now that I’ve moved to a low carb diet, it’s great that I can still have this option. 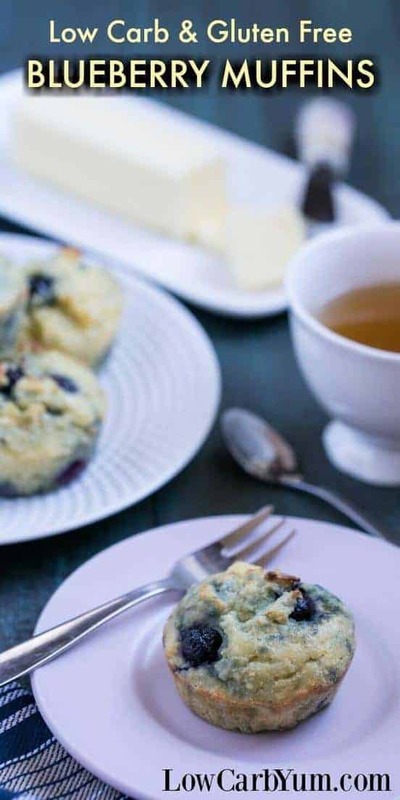 Using a mix of almond and coconut flours makes this a great gluten free blueberry muffin as well. If you aren’t following a low carb diet, you can always sub out the erythritol and stevia with 1/3 cup honey or sugar. There is natural fruit sugar in the blueberries so use less berries in these low carb blueberry muffins if you want to cut the carbs. For a little sweeter muffin, you can sprinkle on a bit of sweetener or streusel on top. It’s pretty easy to make a streusel. 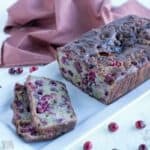 You can use the topping in the low carb coffee cake recipe. Or, you can check out the streusel topping used on muffins over at Wholesome Yum. I prefer my gluten free blueberry muffins with only a touch of sweet. 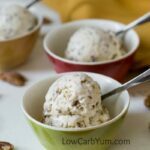 Once you eliminate sugar from your diet, you find you don’t like overly sweet treats anymore. 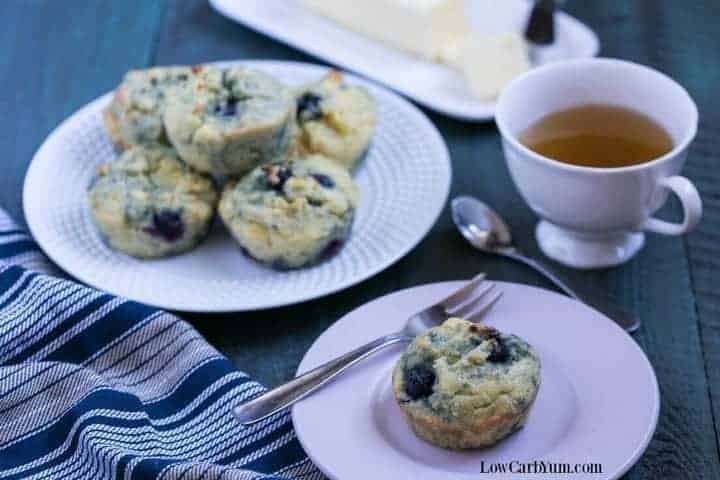 Be sure to slather these low carb blueberry muffins with some yummy butter. Even after I grill muffins in butter, I like to add a bit more butter on top just because it enhances the flavor so much. 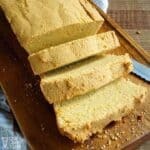 Sometimes, coconut flour can make baked goods dry. And, it does vary by brand. So, if you find the batter super thick, you may want to add more water or a small amount of low carb milk or extra butter. Personally, I don’t think you can ever have too much butter. 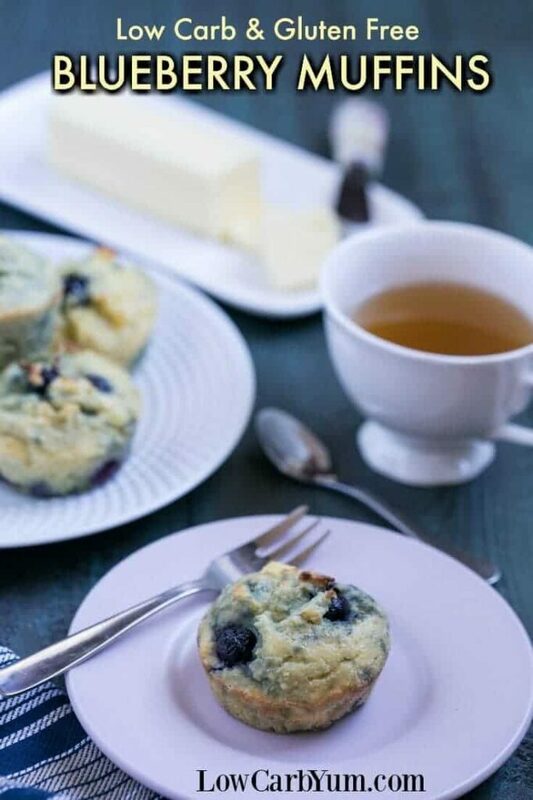 If you follow a paleo low carb diet, you’ll just need to substitute the butter with ghee in this low carb blueberry muffins recipe. 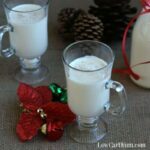 Some of you may have a favorite baking mix that you use. 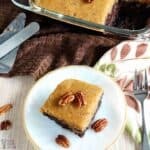 I typically use a combination of almond and coconut flour, but they can be replaced with any low carb baking mix instead. 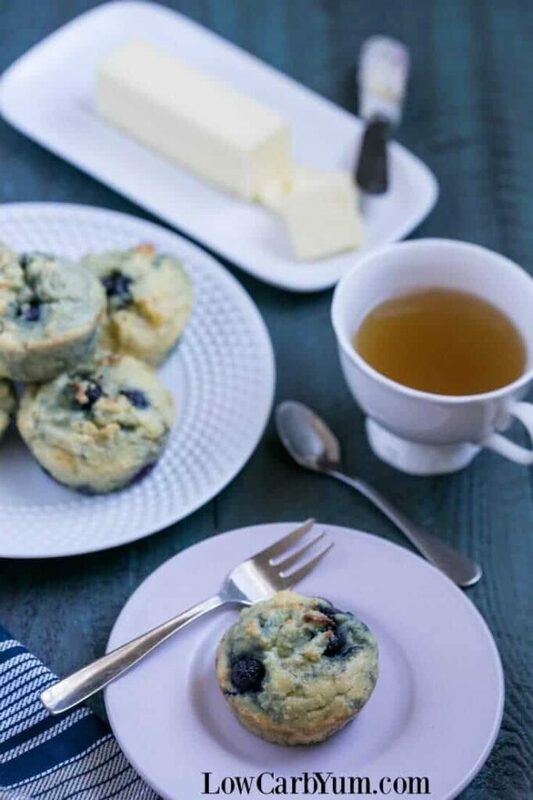 I enjoy these gluten free blueberry muffins with a cup of tea in the morning at work. It’s a real treat to have homemade baked goods when all my coworkers are enjoying goodies from the local bakery. 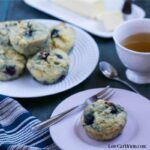 Since posting this recipe, I’ve come up with a few other recipes for low carb blueberry muffins. If you need something quick, you can try my muffin-in-a-minute version. I also have this one that adds zucchini which makes the muffins super moist. You can also bake the batter for these muffins in a small loaf pan instead. You’ll want to double the recipe to use the standard 9×5-inch loaf pan. Yummy gluten free blueberry muffins to start your day. 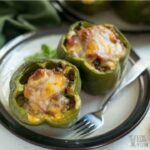 These low carb muffins are quick and easy to prepare as a warm breakfast treat. Mix almond flour, coconut flour, baking powder and salt in small bowl. Set aside. In separate bowl, whisk eggs, butter, water, erythritol, stevia and lemon extract. Mix dry ingredients into wet ingredients and stir until well combined. Fold in blueberries. 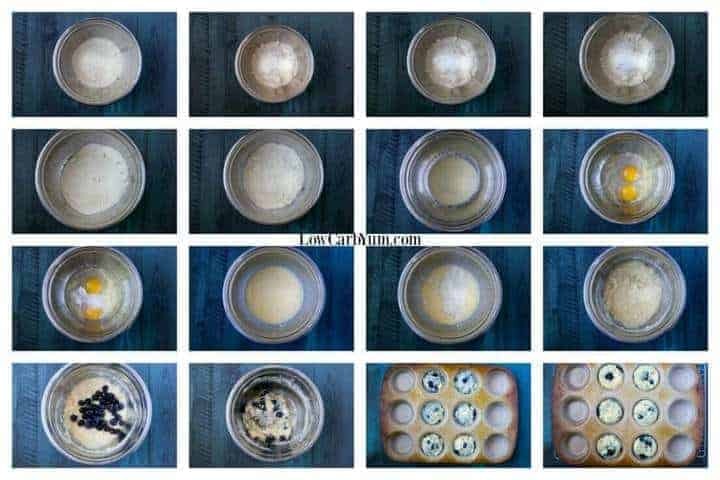 Spoon batter equally into 6 muffin cups. Bake for 20-25 minutes or until lightly brown. Cool in pan 5-10 minutes then remove from pan and cool muffins on rack. 1 teaspoons vanilla extract can be added for a to enhance and sweeten the taste. 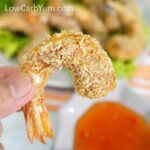 The erythritol and stevia can be substituted with 1/3 cup honey or coconut sugar for those not following low carb.